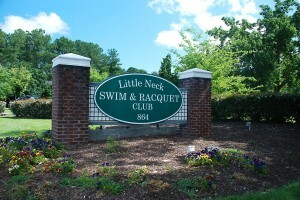 Little Neck is a wonderful community of homes nestled between the Eastern and Western Branches of the Lynnhaven River – due North from its tip is the Lesner Bridge and the Chesapeake Bay. We have inherited a rich history from the Algonquian nation tribe known as Chesapeakes who enjoyed life along the shores of the Little Neck peninsula to the watermen who later made their living harvesting oysters. Residents of Little Neck have good reasons to be proud of their neighborhood. Known for its beautiful waterways, majestic tree canopy, spacious lots, and abundance of neighborhood parks and trails, Little Neck offers a variety of home styles from cozy ranches to estates on the Lynnhaven River. Summer evenings you can hear the laughter of children and hear the chimes ringing in the warm breezes, smell the goodness of summer as dinner cooks on the grill, and see the incredible sunsets over the western shore of the Lynnhaven River. Little Neck feels like an oasis, but offers easy access to interstates, Towne Center, the Oceanfront and a wide variety of shopping, restaurants, and cultural entertainment. Neighborhood schools are a draw and you won’t mind at all getting to know your neighbors at the Little Neck Swim and Racquet Club, civic league or garden club meetings, and neighborhood get-togethers. Our neighborhood data is consolidated from multiple sources and includes current listings, recent sales, and more. Whether you’re a Buyer or Seller, let us be your local real estate resource. Call or email anytime to discuss how our up-to-the-minute market information can benefit you! While we are based in Virginia Beach we sell property all over Coastal Virginia. Our Coastal Virginia cities include Virginia Beach, Norfolk, Chesapeake, Portsmouth, Suffolk, Hampton, and Newport News. You can find us working with clients in the Williamsburg area, Gloucester on up to the Northern Neck and over to the Eastern Shore. Coastal Virginia real estate is highly sought after because Coastal Virginia has miles of waterfront properties and beaches, all of which contribute to the diversity and stability of the region's economy. There are always ocean front, river front, lake front and harbor front listings available. We are successful, high-energy REALTORS® who focus on integrity and excellent service. Give us a call and enjoy using our website. We look forward to Guiding Your Next Move.